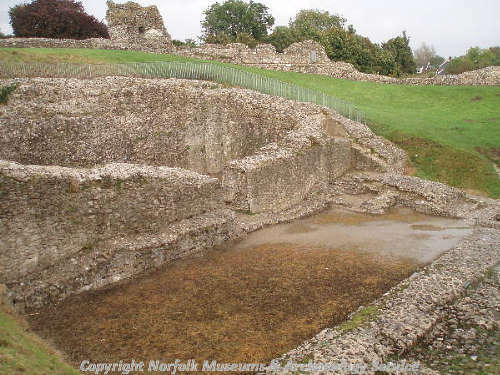 The substantial ruins of a Norman castle, which were extensively excavated during the 1970s and 1980s. A Late Saxon hall with modest defences, which was held by a Saxon thegn called Toki, was replaced by a stone building after the Conquest when the castle was held by William of Warenne. This building was more like a country house than a castle, and was replaced by a keep in the 12th century, when the defences were also strengthened. The outer bailey was also replanned in the 12th century, and turned into a planned market town, which had a market place at Pale's Green. The castle became derelict later in the medieval period, probably by the 14th century. The Castle was founded and built by William de Warenne who was granted the land shortly after the Norman Conquest. The Norman country house was converted into a keep c. AD 1140 and later in the 12th century became a shell keep. The remains of a 12th century gatehouse survives to the west with evidence of the draw bar for securing the gates and the slot for the portcullis. 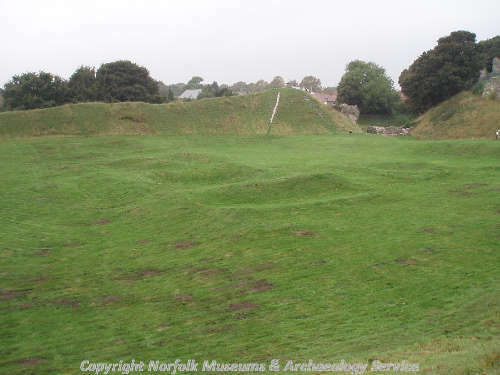 The late 11th century and 12th century remains of the castle are surrounded by very impressive earthworks including a motte with its own ditch at the northern end, rectangular bailey surrounded by a bank and ditch and the remains of a barbican enclosure to the east. The bailey is surrounded by high earthen banks and the imprint of the hall is visible in the centre. Norman motte and bailey castle and town defences, wrongly called a Roman fort in the past. Original site of priory in 1089. Pottery found, thought to be Roman but is more probably Late Saxon or medieval. 1 prehistoric fragmentary chipped flint axehead. Donated to Norwich Castle Museum (NWHCM : 1959.310). Information from (S12). Although originally recorded as Neolithic this object was subsequently examined by R. Jacobi and re-identified as a Mesolithic tranchet adze. Information from (S13). Amended by P. Watkins (HES), 7 August 2014. Full excavation of castle and trial trenches of town defences revealed a possible Late Saxon hall which was superceded by the castle. The Hall stood on the motte, and was altered to form a rectangular keep but was never completed. Motte was raised to form a shell keep. Finds included prehistoric sherds and flints, Roman, Middle Saxon and Late Saxon pottery as well as medieval. Post-medieval witchcraft deposit, with a human skull and the skeleton of a kitten. Excavations outside east bailey by NAU. Juvenile burial discovered by workmen digging post hole(s) within castle. No details of location of find. See report by  in file. A. Rogerson (NLA), 19 July 1999. See report (S4) for further details and plan. Site included in (S9) and survey also noted in (S14). B. Cushion (NLA), 8 February 2000. For full details, photos and press cuttings see report in file. E. Rose (NLA), 9 February 2000. September 2001. Watching brief on route of BT cable. Two areas of rammed chalk, thought to be the foundations of post medieval buildings. Tile, clazed red earthernware and nail. A. Hutcheson (NLA), 3 October 2001. 2002. Section 17 Management Agreement. H. Paterson (A&E), 4 April 2002. Extensive scrub clearance and removal of rubbish deposited over decades has been undertaken under a Section 17 agreement concluded between owners and English Heritage. The wet bank and ditch has been cleared of scrub by hand cutting. Selective tree surgery will be carried out on east side in December. New fencing erected at end and alongside churchyard. H. Paterson (A&E), 3 April 2002. August 2002. Watching brief on erection of 5 new interpretation panels. H. Paterson (A&E), August 2002. (S5) examines the historical context of the castle, concluding that it represents a remarkable continuity of high status settlement across the Conquest years, with the new stone castle built on the site of Toki's manor house. 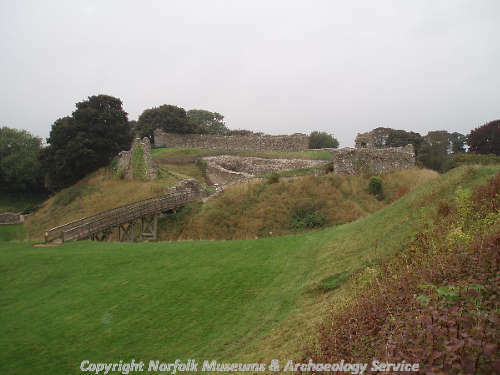 Five architectural fragments were recovered during repairs to a large erosion scar in the outer bailey mound. Four pieces were of Caen limestone and one was clunch. Tool marks are clearly visible on the Caen stone. See (S6) for more details. Five year Section 17 management agreement signed for town defences at Dyke Hills. D. Robertson (HES), 25 September 2012. --- Aerial Photograph: see file. --- Unpublished Document: Paterson, H.. 2001. BT Works at Castle Acre 2001. --- Aerial Photograph: Edwards, D.A. (NLA). 1994. TF 8115AGF - AGG. --- Aerial Photograph: Edwards, D.A. (NLA). 1997. TF 8115AGT. --- Aerial Photograph: Edwards, D.A. (NLA). 1996. TF 8115AGH - AGP. --- Unpublished Document: Paterson, H.. 2002. Watching Brief Report. --- Article in Serial: Cherry, J.. 1985. Castles of the Conqueror.. British Museum Society Bulletin. No 49. --- Newspaper Article: 1982. Eastern Daily Press. 23 March. --- Newspaper Article: 1985. Eastern Daily Press. 19 January. --- Newspaper Article: 1985. Eastern Daily Press. 21 January. --- Newspaper Article: 1985. Eastern Daily Press. 9 February. --- Newspaper Article: 1985. Eastern Daily Press. 13 February. --- Newspaper Article: 1986. Eastern Daily Press. 14 March. --- Newspaper Article: Lynn News. 1999. 28 February. --- Newspaper Article: 1999. Eastern Daily Press. 25 June. --- Newspaper Article: Eastern Daily Press. 2008. A reminder of our rich heritage. 20 August. --- Newspaper Article: Eastern Daily Press. 2010. Explore west to find our treasure.. 1 November. --- Archive: Clarke, R. R. and NCM Staff. 1933-1973. Norwich Castle Museum Record Card - Medieval. 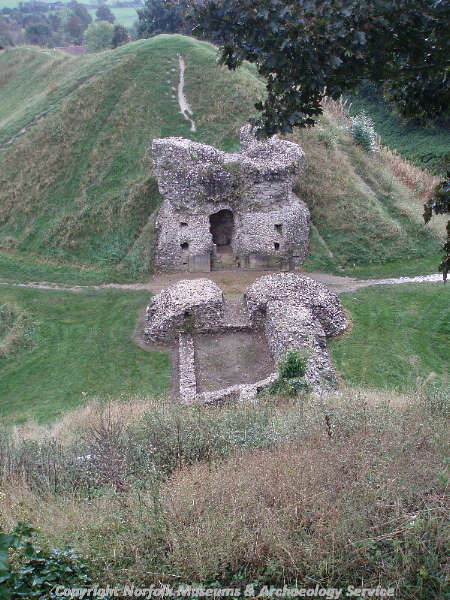 Castle Acre . --- Article in Serial: Sutermeister, H. 1972. Castle Acre. Norfolk Research Committee Newsletter and Bulletin. Series 2 No 9 p 15. --- Oblique Aerial Photograph: Edwards, D.. 1991. NHER TF 8115/AEN/Z3 (EDWARDS), 10-DEC-1991. --- Photograph: CBY 23, 25. CBH 12, CBY 19-21. JM 3-6, CRL, CRM, FHW 32-36. --- Unpublished Report: Cushion, B. 2000. Castle Acre Castle SMR 3449. <S1> Unpublished Document: Heywood, S.. Castle Acre Castle, Bailey Street, Castle Acre, King's Lynn, Norfolk..
<S2> Article in Serial: Coad, J. and Streeten, A. D. F.. 1982. Excavations at Castle Acre Castle, Norfolk, 1972 to 1977: Country House and Castle of the Norman Earls of Surrey.. Archaelogical Journal. Vol 139, p 138ff. pp138-301. <S3> Article in Serial: Coad, J., Streeten, A.D.F. and Warmington, R.. 1987. Excavations at Castle Acre Castle, Norfolk, 1975-1982. The Bridges, Lime Kilns, and Eastern Gatehouse.. The Archaeological Journal. Vol 144, pp 256-307. vol 144, pp 256-308. <S5> Monograph: Liddiard, R.. 2000. 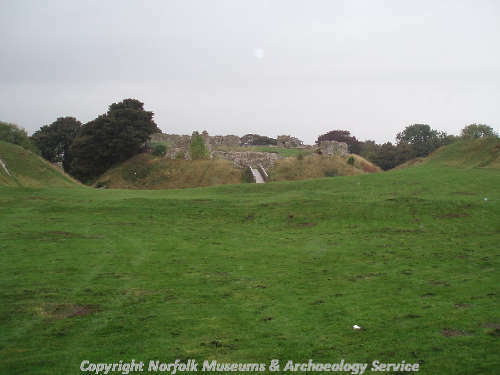 Landscapes of lordship: Norman castles and the countryside in medieval Norfolk, 1066-1200.. pp 28-31, 44-45. <S6> Unpublished Contractor Report: Hobbs, B. 2008. 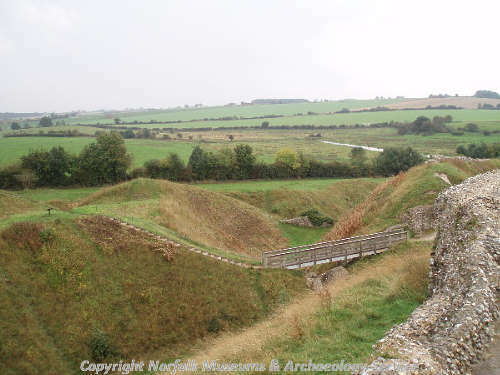 An Archaeological Watching Brief at Castle Acre Castle, Castle Acre, Norfolk. NAU Archaeology. 2007. <S7> Slide: Various. Slide. 52-69. <S8> Article in Serial: Gurney, D & Hoggett, R. 2009. Excavations and Surveys in Norfolk in 2008. Norfolk Archaeology. XLV Part IV pp 570-578. p 572. <S9> Monograph: Cushion, B. and Davison, A. 2003. 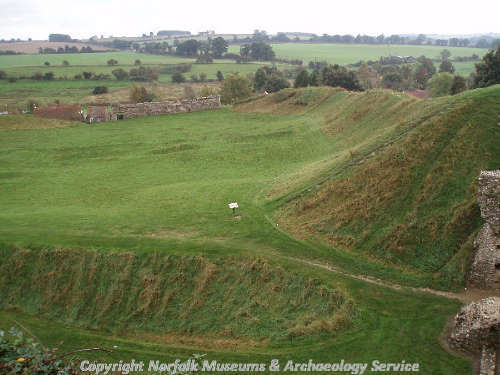 Earthworks of Norfolk. East Anglian Archaeology. No 104. p 165. <S10> Unpublished Document: Norfolk County Council. 2009-2010. Norfolk Monuments Management Project Section 17 agreement. <S11> Illustration: Unknown. Sketch plan of the Castle Acre site.. Film. <S12> Archive: Clarke, R. R. and NCM Staff. 1933-1973. Norwich Castle Museum Record Card - Neolithic. Castle Acre. <S13> Archive: R. Jacobi. -. Jacobi Archive. 10178. <S14> Article in Serial: Gurney, D. and Penn, K. (eds). 2001. Excavations and Surveys in Norfolk 2000. Norfolk Archaeology. XLIII Pt IV pp 707-728. p 710.